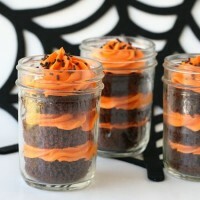 I’ve been enjoying sharing lots of fall recipes, but today is a little break from fall themed treats. Today we’re part of a baby shower! Ok… so it’s just a “virtual” shower, but when your a super sweet blogger like Kristan of Confessions of a Cookbook Queen, you’re bound to have friends from every end of the country. Since we couldn’t all celebrate with Kristan in person, some of her blogging buddies have teamed up to “shower” Kristan with some special treats, made in her honor (but eaten by us!). 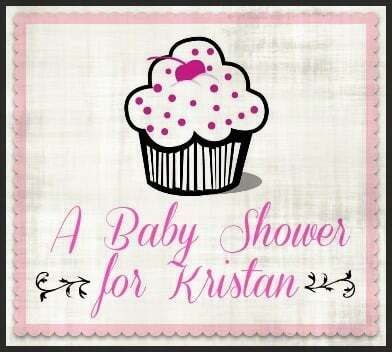 Kristan is due any day with a sweet baby girl, Lucy. I made a batch of my favorite Chocolate Cupcakes and topped them with Vanilla Cream Cheese Frosting. Then, I added some personalized fondant toppers for this special occasion. This style of topper could certainly be made for any variety of occasions! You could spell out a message (as shown above), or include a single initial for a wedding, or personalized gift. 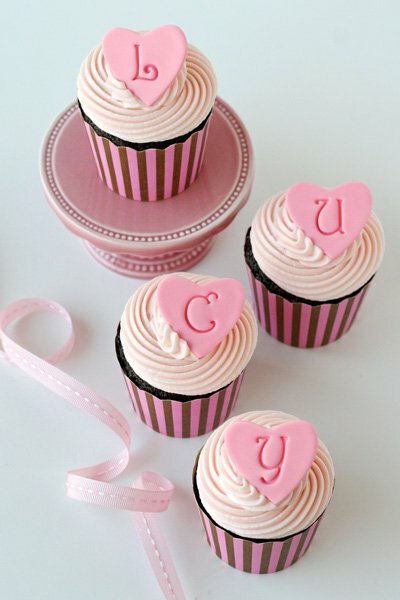 Want to make your own stamped fondant toppers? They’re quite easy and so versatile! 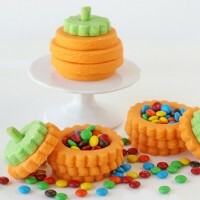 If you’re not familiar with working with fondant, start with a previous post of mine, Fondant 101. 2. Cut a small heart, or any shape desired. 3.-4. Press a stamp into the heart. 5. Set the fondant accent on a paper plate or lint free paper towel to dry. 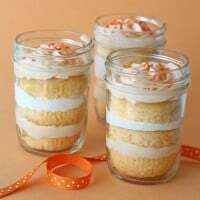 Allow to dry several hours (preferably 1-2 days) before adding to cupcakes. Fondant accents may be made several weeks in advance and stored in a tupperware type container. I keep mine sealed, but in more humid climates you may want to leave the container slightly cracked open. Prop note- The cupcake liners I purchased recently at Home Goods. 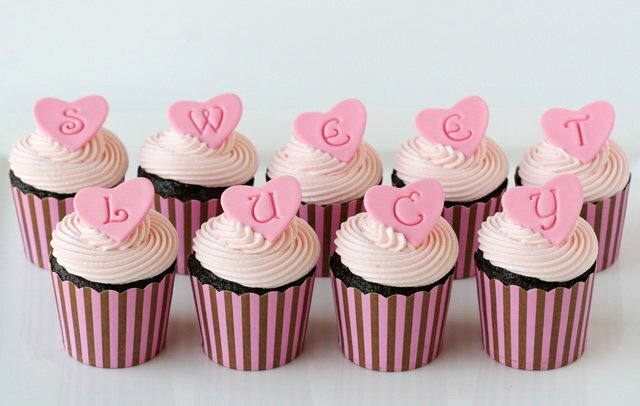 Similar cupcake cases available from The Tomkat Studio or Shop Sweet Lulu. And what’s a baby shower without lots of yummy treats? Check out all of the beautiful and deicious things Kristan’s friends have whipped up! Congratulations Kristan! We can’t wait to meet your sweet little girl! 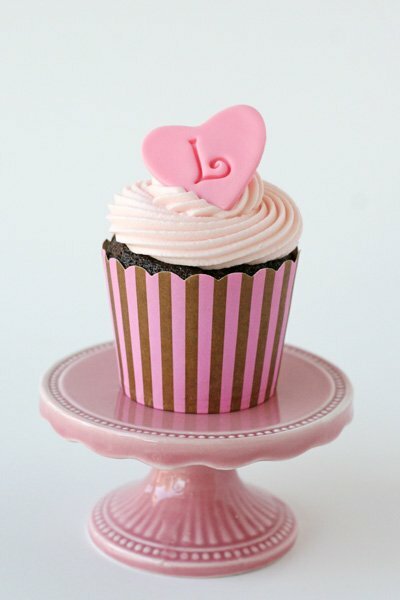 Oh my — where did you get that adorable cupcake pedestal? I want some! Hi! I’m a huge fan of yours despite the distance (I’m from Chile!!). 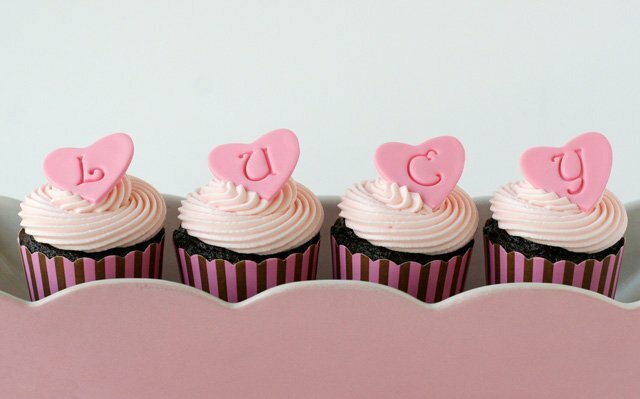 I wanted to ask you about the stamps you used for your sweet baby cupcakes… I’ve been trying to find them at Michaels.com, but they don’t seem to carry them any more. I find that those letters are very cute. It’s hard to shop on-line. Any hint? FYI for all, looks like you can get those stamps here! They took my breath away.